New and exciting electrical discharge, Holy z pinch batman. 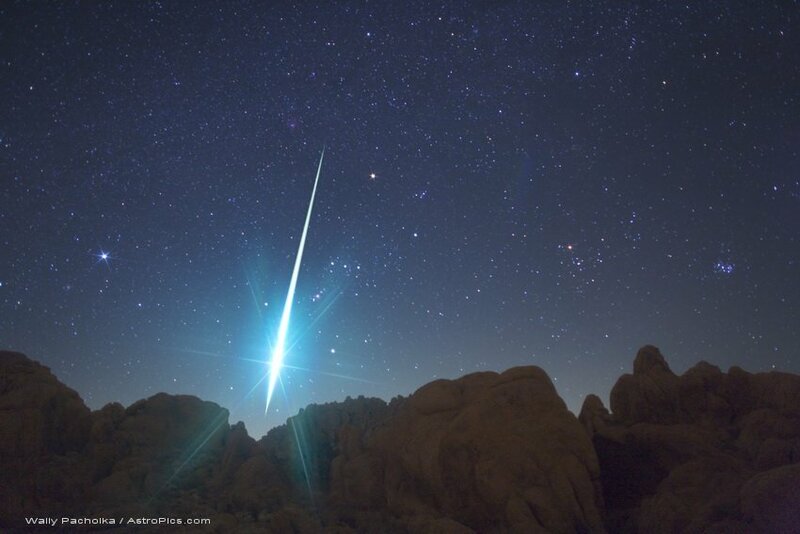 GREAT FIREBALL: A remarkable midnight fireball that "turned night into day" over parts of the western United States last night was not a Leonid. Infrasound measurements suggest a sporadic asteroid not associated with the Leonid debris stream. The space rock exploded in the atmosphere with an energy equivalent to 0.5 - 1 kilotons of TNT. Approximately 6 hours later, observers in Utah and Colorado witnessed a twisting iridescent-blue cloud in the dawn sky. Debris from the fireball should have dissipated by that time, but the cloud remains unexplained; we cannot yet rule out a connection to the fireball event. Stay tuned for further analysis. Thanks to NASA SpaceWeather and the CTV national news. "If the earthquake is confirmed, as it appears to be, I think we have the most cosmic of coincidences: A large fireball around the same time of an earthquake," says Chab. "I am simply amazed!" One possible interpretation of these events is that a small asteroid hit Earth's atmosphere and caused the ground to shake when it exploded in mid-air. However, the timing might not be right. The quake seems to have preceded the fireball. Several readers have pointed out studies that associate lightning-like phenomena with earthquakes: #1, #2, #3. So, the earthquake might be responsible for both the shaking and the light show. Or it might be a big coincidence just as Chab suggests. More reports could help sort out the possibilities. Readers in Nebraska with photos or eyewitness accounts are encouraged to submit their observations. Is it a coincidence also that the Sun let out a big CME a couple of days ago, and suddenly developed a new sunspot? The recently invisible spot is now nine times wider than Earth and crackling with C-class solar flares. A series of eruptions on Dec. 16th sent two and perhaps three coronal mass ejections (CMEs) in the general direction of our planet. High-latitude sky watchers should be alert for auroras when the clouds arrive beginning on Dec. 18th or 19th. 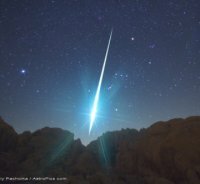 I'm wondering if there is any info as to the exact time and location of WP's Geminid. I was unplugging Christmas lights at right around midnight Sunday night [13/14th] when the shower was happening, and saw an unusually bright meteor streak toward the south through Orion just as depicted in WP's photo. It was the only clear night in Seattle for several days, and the Geminids were beautiful, about 1 per minute perhaps. Is there anyone out there with enough expertise to determine what the radius of influence of some incoming meteor would be wrt transferring enough [electrical] energy to the surface to trigger an earthquake? Too many factors for me to even begin to think about it. Not too many factors, not at all....the incoming high electric stress of the meteor, will cause a electric discharge within the piezoelectric domains of the earths mantle, this will cause a slip and a earthquake. and play around, you can see the Geminids orbit, and how, to me, there could now be a connection to the Sun. Mad idea? I'm not claiming any expertise. If you look at the whole Earth system as a series of concentric shells with each layer containing a greater level of charge as you move out from the centre. A change in one layer is going to cause a greater potential difference between layers and the energy would be transferred down through the system. If you go to an arcade there's a simple game that I loved as a kid. The machine has a series of oscillating shelves with a stack of coins on them. You drop a coin onto the top shelf and hope that this causes coins to be pushed off the edge onto a lower shelf which will push more coins down into the tray below. Something like that? I was wondering if the Geminids were traveling in a plasma torus that would be a conductor to the Sun. I wondered about this too. I don't see how a bunch of finely particulated dust can cause the incredible displays associated with the Gemenids or perseids etc. The Earth is constantly being bombarded by meteors which burn up in the mesosphere. Could the Earth be passing through a more highly charged torus around the Sun which is increasing the potential difference between the Earth's magnetosphere and interstellar space and it is the increased voltage difference which is causing the usual traffic of meteors to discharge more energetically? "I was doing homework on my computer at about that time and my internet connection unexpectedly quit. I couldn't get it back up until about 9:15. I didn't feel anything, but I think the internet lines were messed up because of it. A few of my friends in Lincoln had the same problem." Your link to concentric shells doesn't do justice to the actual geometry of the atmospheric shells of Earth. Whoa...thanks for posting this Web, I'd never seen that relationship before. It's strange the way everything seems to lead back to cymatics. On the 16th there were some C class x-ray flares. It kind of stands out in the midst of this extended quiet period. There was a CME that day as well, but it was pretty weak and slow moving, reaching Earth on the weekend. The increase in x-ray activity, however, would have an almost immediate effect and might have produced enhanced ionization/heating (think microwave oven) in the thermosphere reaching down into the mesosphere over that fault zone. That may have produced ball lightning in association with the earthquake. The description was of a fireball on a low, shallow trajectory, that was green in color, with orange streamers and a short "tail". It happened a few minutes after the quake which might indicate the initiation of an "ion storm" in the upper atmosphere to "seed" a plasmoid in the denser stratosphere. It may have been part of a geomagnetic "trigger" that initiated the quake in the first place. Not saying that all solar flares trigger quakes, but they might be a factor under certain conditions. I work in a call centre dealing with telecomunications. I noticed that whenever the Earth encounters Solar flares, causing increased auroral activity, there tends to be an effect on the mobile phone networks. Around two years ago this happened twice over February and March. On both occasions there were Earthquakes the following day, I think one was in Greece and the other was in Iran. It does seem that, when the Earth encounters CME's there is an increased risk of earthquakes. There was a thread on the old forum. This is not a CME but it would be interesting to see if this produces a more active aurora and if there any tertiary effects. Blackberry network just went down and O2 network is affected. It will be interesting to see if the recent sunspots, CMEs and flares die down in a short while. If the earth went through a Geminid containing plasma torus, then how long would any effects between the earth and sun take to show up, and how long would they continue? Too bad we can't see all the E/M and plasma structures and their interactions, going on all around us.